While it appears to be a four-team race for National Champion, a lot of basketball still to be played. It's really a four-team race now — Miami Country Day (Miami), St. John's (Washington, D.C.), Centennial (Las Vegas) and Africentric (Columbus, Ohio) are way ahead in the race for the No. 1 ranking on the last day, and even though St. John's is No. 2, the Washington Catholic Athletic Conference champion may be in the best position of all. First, Miami Country Day is going to play in the GEICO National High School Championships, along with Centennial and No. 5 New Hope (most likely). Though MCD has risen to the challenge every time this year when playing the nation's best, sooner or later injury, luck, bad calls or just a bad game can flip the script. Centennial's chances require two outcomes: 1) Centennial wins the GEICO; and 2) St. John's finds a way to lose in D.C. Though the first is certainly possible, the second is much less likely. Africentric, the only unbeaten team but also the team with the weakest resume, must hope that neither Centennial or MCD wins the GEICO, and that St. John's loses. And oh yes, Africentric must win Ohio's Division III title, but a loss there would be the biggest upset we've discussed so far. If all four of those teams figure out a way to lose, and New Hope wins the GEICO, then it gets tricky, as it's hard to see a three-loss team — which New Hope is — on top of the rankings. But there's a month to go, and things could change quickly. After all, last year at this time, Central Valley was just an afterthought (ranked No. 18) and finished as the national champion. NOTE: Teams that wish to be recognized either locally or nationally should make sure their information – schedule, results, roster, coach, etc. — is up to date on MaxPreps. Questions? Comments? Concerns? Email us at coachsupport@maxpreps.com. Despite the glittering records of Wednesday's opponent in the Florida 4A playoffs (P.K. Yonge is 28-1) and the presence of 26-1 Carrollwood Day in the other semifinal, Miami Country Day is expected to roll to the title and get ready to play in the GEICO National High School Championships in April. St. John's left no doubt as to who's the best team in the DMV by pulling away in the fourth quarter and beating No. 6 Bishop McNamara for the third straight time. This weekend, the season will wind up in the Class AA District of Columbia playoffs, with 25-3 Georgetown Visitation the biggest stumbling block. The other five teams in the Nevada 4A state championships this weekend appear to have little chance of an upset, but the reason Centennial jumps to No. 3 is its expected trip to the GEICO championships, where it will likely have a chance to take down No. 1 Miami Country Day. A ways to go in the Ohio Division III playoffs, but most likely won't be seriously tested until the semifinals begin March 14. Yes, New Hope lost to Bishop McNamara back in 2018, but since New Hope has more quality wins than Bishop McNamara. And since both teams are in the Bishop Walsh Girls' Invitational this weekend — along with No. 20 St. Frances (Baltimore), the rankings will sort themselves out on the court. Had the lead in the fourth quarter against No. 2 St. John's, but stalled offensively and lost to its rival for the third straight time. Redemption is possible at the Bishop Walsh tournament this weekend, as both No. 5 New Hope and No. 20 St. Frances will also be there. After one more regular season game Friday, Edison moves on to the Division II District 59 playoff bracket. After that comes the District 15 Regionals on March 11 and 13. The Division I District finals are Saturday, and then the Regionals start March 6. In all, Mount Notre Dame must win six straight games — against increasingly difficult competition — to win the state crown. Hononegah is next in the 4A playoffs, but since Maine West already beat Hononegah 61-39, advancing to the finals Saturday seems likely. But Mother McAuley (Chicago) and Benet Academy (Lisle), the other semifinalists, are both battle-tested, so winning the title will be far from easy. Won first two Division 2 playoff games by a total of 105 points, and though stiffer competition is on the way, expect the nation's No. 10 team to be playing for the Wisconsin championship March 9. Christ the King returns to action Wednesday in the convoluted New York playoff system that will culminate in late March in Glens Falls. In a down year for Empire State basketball, look for Christ the King to be there at the end. Tennessee gives teams every chance to beat their local rivals, as Riverdale has already played Oakland and Blackman five times — and will play one of those teams again Wednesday. And then the likely opponent Saturday is Stone Memorial, which Riverdale has also already beaten. 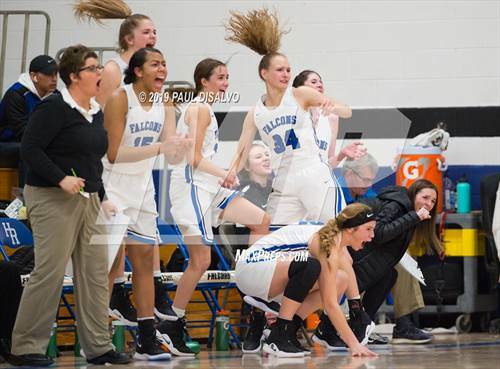 The rematch with Wayzata at Wayzata — the first game was decided by just three points — was a bit of a letdown as Hopkins won 70-49. 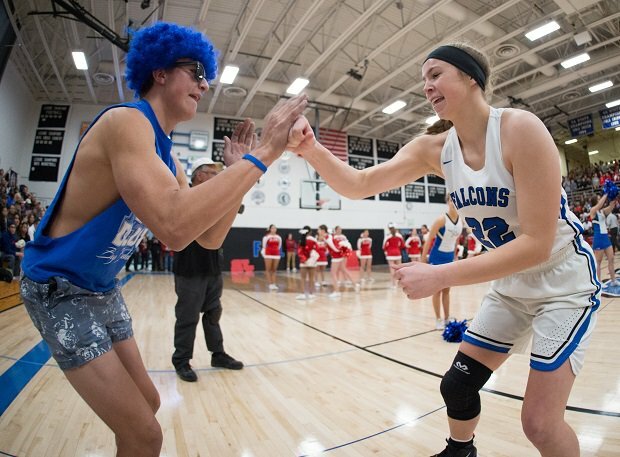 The two are likely to meet again, however, in the Section 6AAAA finals March 7. The Minnesota state championship game will be March 16. 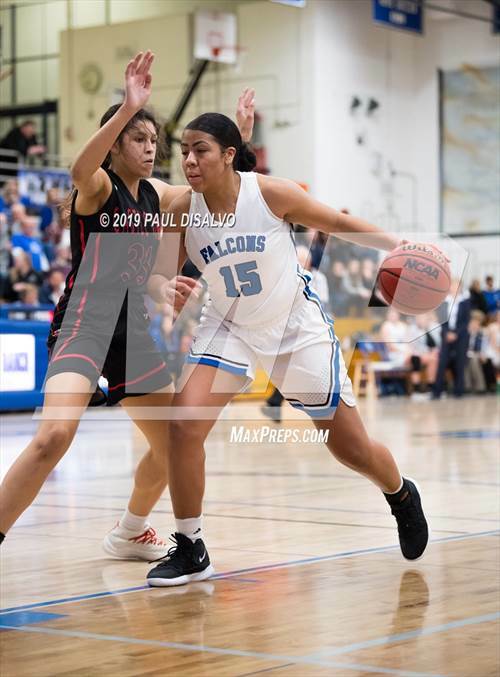 Windward pulled away in the second half of the Southern Section title game to hand Sierra Canyon its first loss of the season, but the two could meet again Saturday in the Southern California Open semifinals. The final, on March 5, will likely feature either Clovis West or Bishop Montgomery as the last step before the state championship game March 9. The first new face this week debuts at No. 15, as Franklin takes the place of St. John-Vianney (Holmdel) as the New Jersey representative. Though Franklin hasn't ventured outside the friendly confines of the Garden State, there are plenty of good teams there, and many tough games ahead before the state champ is crowned. Mitty lost its first two games at the Nike TOC back before Christmas but has not lost since — and handled archrival Pinewood with ease Saturday to earn the top seed in Northern California Open division playoffs. That came with a bye, so Mitty won't play until Saturday. If you believe in comparative scores, Putnam City West fans should be buying state tournament tickets right now. Putnam City West just beat Norman by 18, and Norman beat the new No. 17's next opponent, Norman North, by 19 just three weeks ago. The brutal bloodbath that is the Texas postseason claimed Mansfield Timberview last week, but with only two losses, Mansfield Timberview's credentials are still impressive — so they remain in the Top 25. The season is complete, as the school does not choose to play after their truncated state playoffs end. But because No. 20 St. Frances, which Roland Park beat twice and lost to once, is still playing, it's possible their rivals will jump past them in next week's rankings. No. 5 New Hope and No. 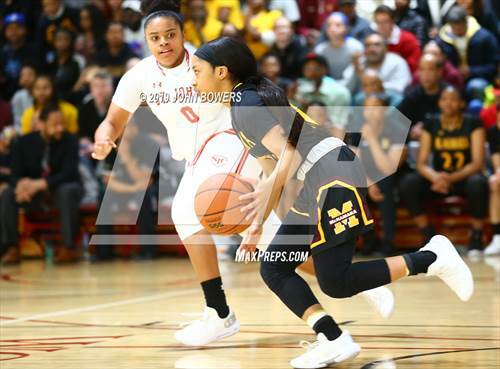 6 Bishop McNamara are also in the field at Bishop Walsh Girls Invitational Tournament, which starts Thursday, so St. Frances has a chance to stake a claim in the Top 10 with three straight wins. 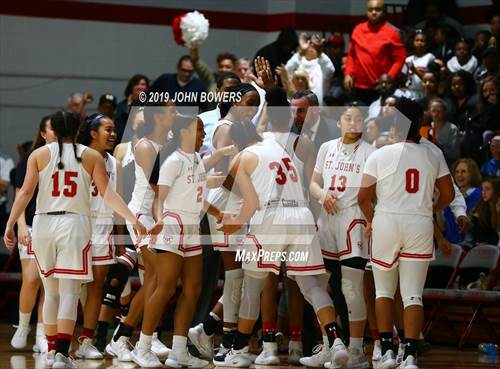 The only loss is to Roland Park, and though Pickerington Central has played some good teams, there aren't enough wins over elite teams to get one of Ohio's best into the top 20. But there's a chance the state final could be against No. 8 Mount Notre Dame, so there's hope. The game Southridge wants in the state playoffs is the one against Tigard, which beat Southridge back on Dec. 7. The other two Southridge losses are to No. 2 St. John's and No. 11 Christ the King, so avenging the Tigard loss could mean a big jump in the rankings. Held off Abington Friends to win by one in the Pennsylvania Independent Schools Athletic Association semis and then blitzed Shipley in the first quarter of the finals to secure its spot in the Top 25. The eight-team Class 5 playoffs begin Thursday, and Princess Anne is favored to win it all on March 6. The jump into the Top 25 is thanks to playing in two quality out-of-state tournaments, and taking down some very good teams. The only loss was to Redondo Union of California, which is one of eight teams in the Open Division of the Southern California Regionals. Dropped out: No. 13 Hamilton Heights Christian Academy (Chattanooga, Tenn.), No. 17 St. John-Vianney (Holmdel, N.J.), No. 18 Hendrickson (Pflugerville, Texas).